Salmon caught at the mouth of the Waimakariri River. The 2006/2007 salmon season has seen the first marked improvement in fish numbers for many years. Most of this improvement, however, seems to have been restricted to the Rangitata River. We are still a very long way from the heady days of 1996. Sea-run salmon are never easy to catch. Even in the best years there are always hard luck stories aplenty of anglers who had fished hard but remained fish-less at seasons end. I was reminded of this recently when talking to an experienced salmon angler about this current season. He and his brother fished together 90 percent of the time. Whilst he had landed seven fish his older brother had managed just the one! Salmon angling is a bit like that. Sometimes you can fish hard all season with meagre results whilst in other years you seem to catch them effortlessly. This year we have seen the salmon season end a month early on 31 March in Fish and Game’s Mid Canterbury region. This has annoyed some anglers who fish the Waitaki River in particular. This river has always fished well in April. 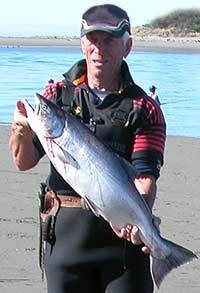 Very good catches have occurred at the river mouth during the month of March. 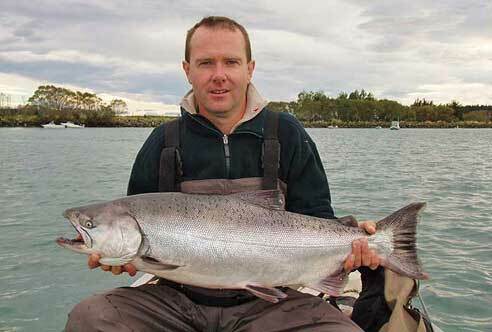 Greg with a big solid looking salmon from McIntosh’s Hole back in 2007. The early closing of the Waitaki River will be a bitter disappointment to some. I know of at least two groups of anglers who travel down from Christchruch to fish for salmon in this big river for a week every April. The early closing is a conservation measure in light of the recent poor seasons. The fact that salmon fishing in the Waitaki was just reaching its peak when the season closed will mean many more fish will get the chance to breed. 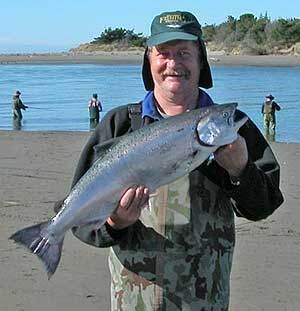 A typical salmon from the mouth of the Waimakariri River this 2006/2007 season. In Alaska Fish and Game often close the big salmon rivers for the season without warning when they believe that such a move is essential to conserve fish stocks. This is especially frustrating for the angler who has travelled from the other side of the globe to fish! Most anglers realise that closing the Central South Island rivers early is a positive move which should, hopefully, bring benefits in two and three years. So watch out for the season 2009/2010. Time will tell on this one! Peter Ritchie who lives at the mouth of the Rangitata River , on the south side, has kept accurate records of salmon landed dating back many years. His reports make interesting reading. 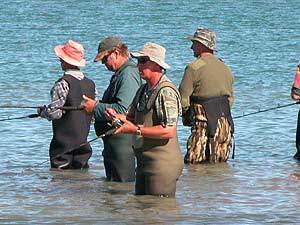 In the season 2005/2006 just 57 fish were caught in the surf and lower river. Whereas this 2006/2007 season over 600 salmon were landed. That is a very substantial increase. By way of comparison as many as 3,500 to 4,000 were caught there in the best seasons dating back in the mid 90s. Fish and Game are aware of three anglers from Ashburton who have each caught in excess of 50 salmon each from the Rangitata River this season! Some holes up-river on the Rangitata have produced 22 – 25 salmon per week. Salmon numbers in the Rangitata River have improved considerably this season. But I’m not so sure about the other main salmon rivers. The peak run in the Rangitata River was between late December and late January. This is the same as previous years. According to Peter Ritchie, earlier this year between the 9th and 29 th of January there were on average 35 salmon taken each day in the Rangitata River below the white post (400 metres above the mouth). On one of those days 58 were caught. This is far in excess of salmon landed at any of the other main rivers: including the Hurunui, Waimakariri, Rakaia or Waitaki. Anglers fishing the Waimakariri River have had a number of good days. On one day in March 19 fish were taken at the mouth and a further 22 at Macintoshes. I think this was the best day but there have been other quite good days as well. The Waimak’ is still producing salmon now! Salmon anglers gather at the confluence of the Kaiapoi and Waimakariri rivers. A popular spot this season.